In a world that seems incredibly shy of well-spoken (ahem) visionaries, it is heartening to me that we have set aside a day to remember and celebrate the life of a leader, unparalleled in the fight for civil rights, who is also one of the greatest orators our country ever produced: Martin Luther King, Jr. To that end, I thought it would be fitting for each of the Reds to share their favorite quote by the Reverend with their thoughts on why it has meaning for them. JENN McKINLAY: Here is mine. "The ultimate measure of a man is not where he stands in moments of comfort and convenience, but where he stands at times of challenge and controversy." - Martin Luther King, Jr. I love these words. To me, they are a trumpet call to my courage, which in times of strife wants to crouch deep inside of me, hiding from disapproval and ostracism. But this sentiment reminds me to be accountable for my action and inaction. It makes me straighten my wobbly legs, stiffen my spine, and stand up strong and tall for what I know is right even if it is met with derision and scorn. I think is why Oprah's speech was such a rousing success last week! I cling to this quote as a reminder that fairness and goodness are the defaults to which we can return, if we persevere. The universe may bend toward justice, but we must be diligent and attentive citizens to help it on its way. It is hard to choose a favorite quote because so many of them seem so apt right now. Like the one that says "nothing in the world is more dangerous than sincere ignorance." But the one that has always resonated with me is "Faith is taking the first step even when you don't see the whole staircase." What a wonderful man. It's good to be reminded that there are people of great wisdom and humility and godliness in the world. HALLIE EPHRON: When I read quotes from Martin Luther King, I hear his soaring voice with its majestic cadences… and also remember the context of the fight for desegregation and against the Vietnam War. It still surprises me how much…and how little has changed. 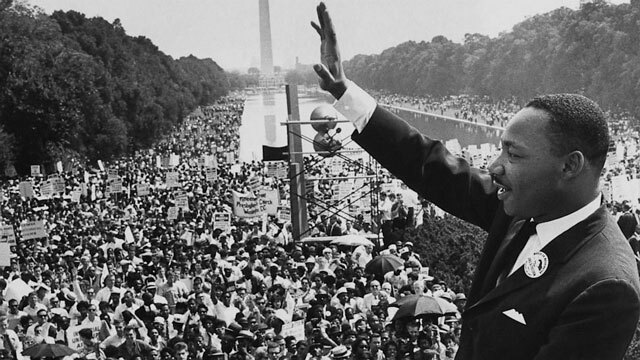 The “I have a dream” speech is loaded with inspiration and calls to action: "I have a dream that one day this nation will rise up and live out the true meaning of its creed - we hold these truths to be self-evident: that all men are created equal." 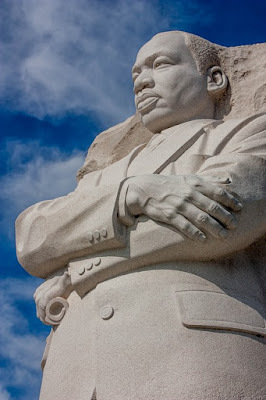 JULIA SPENCER-FLEMING: I had a moving experience a few years back when, visiting family in DC, Ross and I took our kids and our two young nephews to the Martin Luther King Jr. Memorial, which had just opened up two years previously. We arrived after dark, and walked past the huge stone to see the image of Dr. King emerging from the mountain. He stands with his arms crossed, looking directly across the Tidal Basin towards the Jefferson Memorial, as if challenging the slaveholder who was the architect of liberty. The walls around the statue are lined with Dr. King's quotes, and we walked about, reading them aloud and discussing them with our nephews. It felt like a great honor to be there, which is probably the best definition of a memorial I can think of. JULIA: As for quotes, my favorite piece of Dr. King's writing is "Letter from Birmingham Jail," a treatise on nonviolent resistance that rivals Gandhi "Satyagraha." This stands out for me, especially - as many of us have noted - in these times. DEBORAH CROMBIE: Hank, that last quote made me think of what Pope Francis (another of my heroes) said in his New Year's speech about the small actions of ordinary people, praising "...all those persons who, every day, contribute with small but precious gestures to the common good, who seek to do their duty as well as possible." As for Dr. King, what a difficult choice. So much of his writing is both humbling and inspiring--and unsettling, as I'm sure he meant it to be. But two stand out for me particularly. This one, as we deal with a loss of reason in the face of "fake news": "Rarely do we find men who willingly engage in hard, solid thinking. There is an almost universal quest for easy answers and half-baked solutions. Nothing pains some people more than having to think." And this one, so timely in our era of constant social media mudslinging: "Love is the only force capable of transforming an enemy into a friend." What about you, dear Readers? What quotes by the late Dr. King inspire you? Or do you have another quote or motto that guides you? Oh, l love it, Joan. Very timely in so many ways. Thank you for all these inspiring quotes and reflections on them. The memorial in DC is truly awe-inspiring. I encourage everyone to pick up a copy of Misremembering Dr. King: Revisiting the Legacy of Martin Luther King, Jr. by Jennifer Yanco (https://www.amazon.com/Misremembering-Dr-King-Revisiting-Legacy/dp/0253014166). Yes, she's been my best friend for decades, but she's also an activist in the White People Agasint Racism movment. Her book carefully considers the King's Giant Triplets - militarism, materialism, and racism - and where we are today. She says, "My objective is to highlight the important aspects of Dr. King’s work which have all but disappeared from popular memory, so that more of us can really 'see' King." Highly recommend. Thank you, Edith. So important to remember the core of the message and to live it! Thank you, Edith. I've just ordered your friend's book. Inspiration, yes! It has been a long time since I’ve felt that emotion from a world leader. Thank goodness for archives and libraries! My personal guiding principle, which is the basis of all the major religions, is the Golden Rule: Do unto others as you would have them do unto you. But my favorite Dr. King quote is: 'The arc of the moral universe is long, but it always bends towards justice.' That gives me hope, the idea that justice, eventually, will prevail. Five years after the "I have a dream" speech, the area around the reflecting pool of the Washington Monument was occupied for six weeks by freedom and equal rights ralliers. It was called Resurrection City, and I remember going to DC after it was all over (I was 16.) Robert Kennedy was assassinated at the end of it, too, which overshadowed the protest event of more than 50,000 people. The area around the pool--murky from thousands bathing and wading in it during the hot days--was completely bald from rain and foot traffic. I will never forget the sight, which reminded me of how many were passionately working towards equality. Karen - what an amazing aftermath to witness. These events were before my time (sadly, because I like to think I’d have been in the thick of it) and I have great hope that if we could bridge our differences then we can do it now (somehow). Karen, what a powerful picture. And, Jenn, that is a comforting thought. I think we're so caught up in the daily news cycle that we loose sight of "the long arc of justice..."
It's really sad that fifty years later we almost seem to be regressing, though. The original march was organized by Dr. King and the Southern Christian Leadership Conference as a protest against conditions of poor Americans. After he was assassinated, before the march and occupation took place, his leadership role was assumed by Ralph Abernathy. It's a fascinating bit of history that captured headlines at the time, but I've rarely heard anything about it over the years. Such a poignant joy to read this today. Thank you, all. Safe flight, Hank! See you tonight! One Dr. King quote that has inspired me at times when I felt incapable of doing anything about the world's problems is: "If you can’t fly then run, if you can’t run then walk, if you can’t walk then crawl, but whatever you do you have to keep moving forward." In these times of division, I find it useful to recall these: "I have decided to stick to love. Hate is too great a burden to bear." and "Let no man pull you so low as to hate him." And I also love the ones that others have chosen! I struggle with hate one, Jim. I really, really, really hate...er...detest bigotry of any kind. Obviously, it’s been challenging for me for the past year. But I will persist and try not to hate :) Thank you for the reminder to go high. Jenn, I've found that holding hatred hurts only me, certainly not the one to whom it's directed. They largely remain oblivious, while I'm steaming and fretting. It's a useless emotion, really. Took me a long time to get that. I had forgotten that one, Jim, but the words have a resonance with the beautiful African American spiritual, There is a Balm in Gilead: "If you cannot preach like Peter/ If you cannot pray like Paul/ You can tell the love of Jesus/ And say he died for all." According to Wikipedia, that phrase or others very like it were "wandering verses," appearing in many spirituals and revival songs. I suspect it had an extra resonance and depth to Dr. King's original listeners. What a lovely tribute to wonderful humanitarian, we need more like him. I was raised by the principal that we all bleed red and I’ve raised my daughter using that same principle that my dad taught me. It’s so disheartening to see what is happening to our country as far as race relations are concerned, it’s almost like we have gone back in time. I’m reading “I Can’t Breathe” by Matt Taibbi which is a fantastic book, I’ve retired from LE and I’ve worked side by side with racist cops and I fully understand why people of color are distrustful of the police. When I first started out in the early 80’s a little boy spit on my boots and called me a “cracker” I had no idea what he mean’t by that term. I was stunned, I was told to get used to it. I never did, instead it made me want to prove that we weren’t all like what this child had already been conditioned to believe that we were. Sheryl, what an amazing difference you have made in the world with your determination to change things. Thank you. And thanks for the book recommendation- I’ll be sure to look for it. Lovely post on a solemn day. Like Sheryl, I was brought up to believe that we all bleed red. My favorite King quote is one of his most popular: "I have a dream that my four little children will one day live in a nation where they will not be judged by the color of their skin, but by the content of their character." Kait - that’s a favorite of mine, too. “Content of their character” - yes, yes, yes. What a lovely way to start such an important day. So much wisdom. thank you! Thank you, MaryC! It is an important day - we should never forget the wisdom or sacrifice of Dr. King. How hard it is these days, not to remain silent, but to speak only to the factual, not to speculate. That cretin whose name I won't speak thrives on attention, good or bad makes no difference. So I'm trying everyday to remain silent re the latest tweet, the latest s**t h9le quote. Happy Birthday Dr. King. You accomplished great things in your lifetime, but even more important, you inspired the most of the rest of us. Today is also the birthday of my daughter Melinda. When she was ten or eleven, she listened to a cracker neighbor of ours worrying about the rumor of a black family moving into the neighborhood. (Arlington, Texas, what can I say?) The neighbor turned to her and asked what she had to say about that. Melinda's answer was this: "I hope they have a girl my age." Ann - I agree. It is never okay to be silent when injustice happens. And your daughter Melinda - oh, my heart - that was beautiful. Happy Birthday to her! I don't have an inspiring quote to add to those already proffered here. What I have are my memories of those days as I lived through them. You couldn't turn on the radio or the TV in those days without some image of protest troubling the waters of everyday life. Some act of violence numbing you yet again. And still, always moving forward, people troubling the waters of everyday life, stirring things up to the light of day. Today, even I can respond to those daily troubles--take action with a few keystrokes, hit the 'enter' key send a message, let my voice be heard. And every time I do, some small part of my brain wonders: who's 'listening'? Who else might be collecting my name? Paranoia? I hope. Because I don't know what else I can do but use the 'voice' I have until there's no longer a need, or I no longer have a voice..
Flora - it is troubling that the pot needs stirring again. But the brave, like you and me and all the Reds, will keep pushing for what’s right and we’ll get there. This, I do believe. Oh how I wish everyone was judged by their character regardless of race, sexual orientation, etc. Me, too, Cathy, me, too. And, no, using the "me too" movement wasn't intended here but...¯\_(ツ)_/¯...it fits. That was me, Jenn, forgot to log out of blogger. Ugh. "Do unto others as you would have them do unto you" has been my moral compass phrase. Not as elegant as MLK passages but in the same ballpark. That one works for me, Gerald! My favorite is the same as Lucy's - "Darkness cannot drive out darkness..."
Also, his quote about little things reminds me of St. Therese of Lisieux: "I cannot do great things. Only small things with great love." And as St. Francis of Assisi said, "Start by doing what's necessary; then do what's possible; and suddenly you are doing the impossible." I love that, Mary/Liz. One step at a time is still moving forward. If anyone needs additional inspiration today, I highly recommend going to see Darkest Hour. Thanks for the rec, Debs! I'll be sure to check it out. All of these Martin Luther King quotes are so full of wisdom and inspiration. What an important part of the world he has been in guiding us toward justice and equality. The man was killed, but his words live forever to give us hope and direction. According to CNN and Newsweek, "King wrote five books and delivered about 450 speeches a year." And, "his words still carry power for activists, politicians, journalists and everyday Americans..." It's rather mind boggling just how many of his words are forever a part of the fabric of our lives--then, now, and to continue into the future. So, it is indeed hard to choose just one quote as a favorite. Each one of the quotes already listed here today are favorites and amazing and a part of my memory bank of what's good in the world. The second quote listed above especially gives me hope for our country today. Kathy = those are fantastic. Thanks so much for digging deep and sharing them. What beautiful and inspiring postings today! I will boil them down to "Do the right thing."